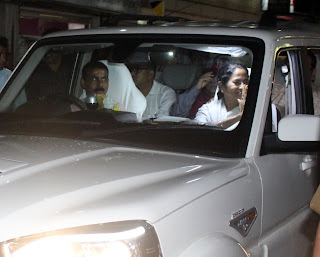 After the declaration of Kalimpong District last November CM Mamata Banerjee reached the declared Kalimpong District late evening around 6.20 pm. Thousands of people from different community lined up in different places to welcome the CM amidst Separate development board demand.CM Banerjee who after declaring the Lepcha Board has come every September in Kalimpong to take part in the Foundation Day of Myang Lyang lepcha development board (MLLDB) which is scheduled tomorrow at Mela Ground where CM herself will take part. The Lepcha has given the title of Kingchoom Darmit( Goddess of Fortune) to CM Banerjee in 2013 for the upliftment of the indigenous tribe of Hill region . The most important incident which was expected earlier before was the closure of NH 10 at Tarjem Jhora at around 3.15 when a landslide from Hills came down heavily when just CM started for Kalimpong. The State PWD roads which in charge of NH 10 quickly came to action and with the help of Three JCB clear the way in a span of an hour just before the CM Crossed the zone. Meanwhile massive member of Lepcha , Tamang , Sherpa Mangar , Khas, Mukhiya , Jogi , Gurung etc along with Jan Andolan Party and Hill TMC from NH 10 Coronation Bridge to Delo welcomed the CM . 9th Mile and Damber Chowk of Kalimpong town saw member of different communities from 9 am in the morning. The CM did not halt anywhere in the town area but she received the masses gratitude through her convoy which was moving slowly where people were standing. CM Banerjee will participate in the 5th Foundation Day of Myang Lyang lepcha development board tomorrow and on 23rd the Foundation day of Tamang Cultural and Development board at Ronaldsay Park homes. All the preparation has been completed. In this program many member of different parties is expected to join hands with TMC. Kalimpong expectation is high with CM words on its District Status. Meanwhile declaration of Separate Board for few left communities of hills is expected. Today too many the communities welcoming the CM demanded Development board. Massive security was beefed up following CM visit. 0 Respones to "CM Mamata Banerjee arrives in Kalimpong"